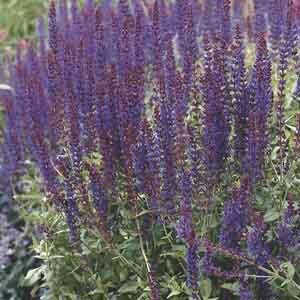 Many of the most popular named varieties of Salvia are of x sylvestris origin. Most have deep blue-purple blooms, much valued by gardeners. Their richly textured foliage and long flowering bloom stalks make them an excellent addition to mixed perennial gardens. The flowers are loved by bees as well.